Every year, the food industry and media come out with lists of things that will be the trends in the upcoming year. Sometimes the writers are correct—kale has been a “thing” for a few years now—while sometimes they miss the boat. Did anyone out there seriously begin to intentionally incorporate insects into their diets in 2018? No, you didn’t. I imagine that bold new source of healthy protein will have to wait a year or two. Mushrooms – both as a health supplement and as an ingredient, I see mushrooms on the rise. My kids, however, still haven’t learned to eat them. But maybe they will in 2019. Mushrooms as supplements are described as “adaptogens”. Adaptogens are supplements that adapt to what your body needs when you eat them. They are also supposed to reduce stress. Don’t tell my kids this when they discover that I have snuck mushrooms into a meal. 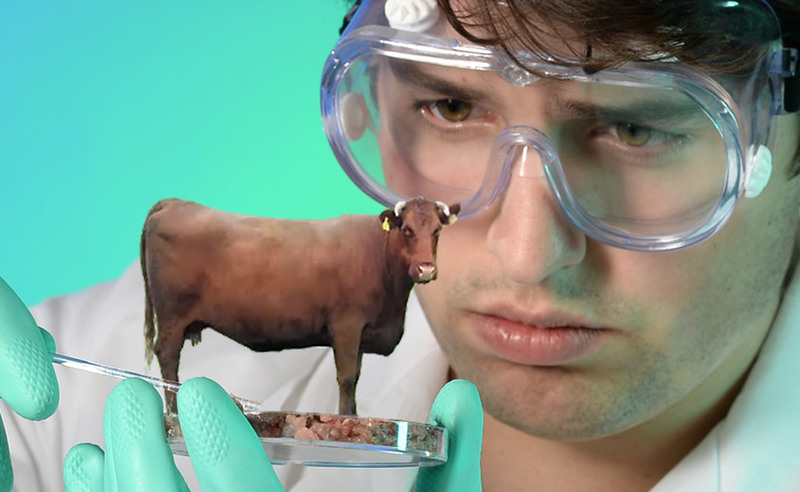 Lab-Engineered Meat – I love the idea of this. I look forward to the growth of this industry. Imagine being able to engineer fatty delicious Waygu beef without all that tedious massaging. Just pull it out of the clone tank. But the technology is nowhere close to making meat in a lab at all affordable. And I imagine fatty Waygu is not the intention as well. I can only believe they will focus on engineering 100% fat free pork. Mediterranean Diet – I always love this. It has been on lists for 20 years. I think the FDA pays to get this way of eating included to somehow encourage us to eat better and be healthier as a country. I love the Mediterranean diet full of vegetables, olive oil, fish, and small amounts of bread, dairy, and fatty meats. Except those last 3 things. I have those in my diet in large amounts. CBD and THC in food – Bring it on! However, due to the slow onset of activity of eaten marijuana psychoactives, sharing THC-infused wild boar with mushroom fricassee with your friends will not get you high with them but will lead to you freaking out on your drive home an hour later. And, it still is not legal in PA. I pick us to be well into the bottom 25 of the states for legalized recreational marijuana. I’m thinking number 37. Drinking Collagen – That sounds disgusting. Even more disgusting is dumping collagen powder into your Natural Sugar Green Tea because collagen will make your skin look younger. Having eaten powdered gelatin, I cannot imagine this is delicious. Get collagen the old fashioned way, by having a nice bowl of chicken soup. But not Chicken Bone Broth. “Bone Broth” was a term created to sell perfectly normal chicken stock for $12/quart. And it was on the list for 2018. Oat Milk – I imagine somewhere there will be a violent war between Oat Milk and the assembled Nut Milks this year for supremacy of the “Mostly Really Disappointing Milk Substitute” title. However, all these substitute milks taste better than the Carnation Instant Milk I had to drink when I was a kid. You knew money was tight when you had weeks of powdered milk. Better Packaging/Reduced Plastics – I really hope this one grows. However, many consumers are unaware that the biodegradable carryout containers and non-plastic straws are many times more expensive than the types we have been accustomed to using. Additionally, nearly all of them are made in China and have skyrocketed in price as trade relations have deteriorated. I sure look forward to some good old Yankee Ingenuity discovering inexpensive, biodegradable, sturdy, and attractive straws and carryout containers. Any Material Scientists have some free time on their hands? Plant-Based Eating – This has been a recurring theme in these lists over the past few years. I am a big supporter of it, as I like to eat plants. I also believe that if I eat more plants, and not potato plants fashioned into French fries or corn plants fashioned into soda pop, that I will become healthier. Cold brew coffee – It isn’t bad but it just isn’t coffee. Avocado toast – Totally delicious, but just too “everywhere”. Fermented everything – Please, let’s give it some rest. I love kim chi as much as the next guy, but fermented mustard seeds really don’t make any sense. Insects – They really aren’t on the out list, I just don’t want to eat them. Bone Broth – It is Stock, ya jags. Chicken Stock. Beef Stock. So good eating in 2019. As far as my list, I will be all over 1, 3, 7, and 8. As far as 4, I might but can’t tell you if I did. Definitely will be chasing after more veggies and The Mediterranean diet. As long as I can keep ice cream. Recipes: Dishes With Veggies (Warm French Green Lentils in Pancetta Vinaigrette; Sliced Brussels Sprout Salad; and Roasted Carrots with Ricotta, Blood Orange, Garlic and Pistachios). See these recipes in action on Pittsburgh Today Live.